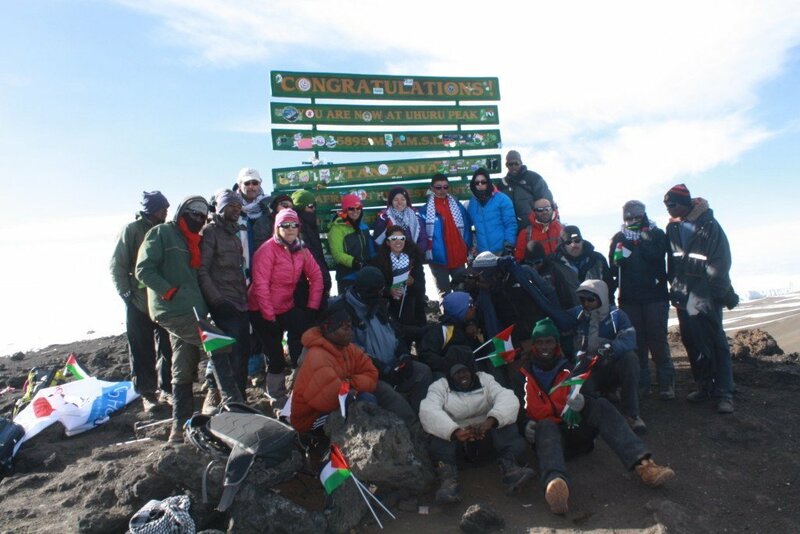 On January 23, 2014, Yasmeen Najjar and Mutussam Abu Karsh became the first two Arab amputees to reach Africa’s highest peak, Uhuru, at the top of Mount Kilimanjaro, bringing pride and hope to kids all over the Middle East. Ibrahim Nasrallah, author of Time of White Horses (Hoopoe, 2016) participated in fundraising for this climb to Mount Kilimanjaro in an attempt to raise awareness and support for the plight of injured and sick children in Palestine and to raise donations for the Palestine Children’s Relief Fund (PCRF), a non-profit organization that provides cost-free medical care and humanitarian relief for sick and injured children in the Middle East. On January 17, 2014, Nasrallah and a group of other volunteers, led by Suzanne Al-Houby, the first Arab and Palestinian woman to reach the summit of Mount Everest, set off with Najjar and Abu Karsh, two injured Palestinian children to climb Mount Kilimanjaro. The two teenagers, each of whom who lost a leg during their childhood after having sustained injuries from Israeli military forces in the Occupied Territories, were treated by PCRF. Established in 1991 during the first Intifada, PCRF has sent over 1000 needy children abroad for medical care, while also treating thousands more in their home country. Ibrahim Nasrallah spent his childhood and youth in the Alwehdat Palestinian Refugee Camp in Amman. He has written fourteen collections of poetry, works of literary criticism, and more than a dozen novels, including Time of White Horses, which tells about the struggles and challenges of village life in an epic period of Palestinian history. Nasrallah is also a painter and photographer.